‘Dostoyevsky is the only psychologist from whom I had something to learn’, remarked Friedrich Nietzsche. ‘He ranks among the most beautiful strokes of fortune in my life’. 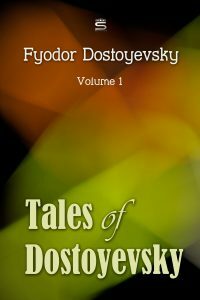 Discover the universal truths and wisdoms of Dostoyevsky in this volume of Dostoyevsky’s tales including: An Honest Thief, The Heavenly Christmas Tree, The Peasant Marey. Read in English, unabridged. Born in Moscow in 1821, Foydor Dostoyevsky is considered to be one of the greatest and most prominent psychologists in world literature. Dostoyevsky was incarcerated in 1849 for being part of the liberal intellectual group the Petrashevsky Circle. He also suffered from an acute gambling compulsion. Crime and Punishment was completed in a mad hurry because he was in urgent need of an advance from his publisher. Motivated by the dual wish to escape his creditors at home and to visit the casinos abroad, Dostoyevsky travelled to Western Europe in 1862. He visited France, Germany, Switzerland, Italy, and England. In London he attended the 1862 World’s Fair and had a first-hand look at the Crystal Palace, the architectural wonder of the age. The image of the Crystal Palace, which for progressive critics symbolized the dawning of a new age of reason and harmony, was to loom large in Dostoevsky’s works to come, especially Notes from Underground and Crime and Punishment.